The airwaves and social media channels alike have been red hot with activity and comment, most of it negative, exasperated, mocking and even vituperative in tone, in response to Brentford Co-Director of Football Phil Giles’s statement last night updating the supporters on the current state of play regarding the head coaching position at the club. In Lee’s last post-match press conference, he discussed the possibility that the Nottingham Forest game would be his last in charge. This was the expectation of both Rasmus Ankersen and myself. Lee’s comments were made in good faith based on the conversations we held last week. Circumstances this week have meant that we haven’t been able to make the change as originally anticipated. We will continue with our process to find the right long term Head Coach for Brentford, rather than make a hasty appointment. Lee has done a superb job since taking charge in September and we look forward to our game with Bolton on Monday evening. This has been enough to rouse much of the fanbase to fury. Now before everyone starts with the accusation that I am merely a mouthpiece, shill, or an apologist for the club I will make the point that the purpose of these articles is simply for me to spout off and give my opinion about anything and everything that is happening in and around Brentford FC both on and off the pitch. I try to avoid unnecessary knee-jerk reactions and, unlike Keith Stroud and Brendan Malone, allow myself time to think before making a final decision. I try as hard as I can to avoid factual errors by taking soundings from friends and contacts in and around – and sometimes well outside – the club and I always endeavour to check my sources before rushing into print. I also take the laws of libel very seriously indeed. Of course I am probably proved wrong as often – or even more so, than I am correct in my musings, but that is just the luck of the draw. I welcome, publish and respond to any and all feedback and comments to what I write and I am quite used and inured to readers telling me that I am deluded in what I have to say. I have also not held back in heavily criticising the club over its actions whenever I feel that it is justified. Just to give a couple of examples: I felt that certain individuals were naive in the extreme not to anticipate that ongoing behind closed doors negotiations with potential replacements for Mark Warburton would not leak out into the media and cause the horrendous destabilisation that threatened to jeopardise our promotion push last February. I also felt strongly that the club’s initial crisis management was inept and poorly executed in the extreme. The appointment of Marinus Dijkhuizen was also totally bungled and we do not know yet how much its impact will eventually influence the outcome of this season given that we have been forced onto the back foot ever since. I have given a great deal of thought to the current managerial or head coaching hiatus and as far as I am concerned the club cannot and should not be criticised in any way, shape or form for how it has managed and continues to deal with a difficult and complex situation. I feel that the club has acted entirely responsibly in this entire process and does not deserve the flack that it is receiving from all quarters. Hiring a new manager or head coach is an extremely complex and crucial undertaking. There are so many variables that can change or go wrong. You are dealing with a plethora of individuals, from the candidates themselves, to their agents and representatives. You then have to negotiate with the club and cope with family interests as well. In other words there is a lot of juggling that needs to be done and so much is totally out of your own hands. I am happy and content that Lee Carsley will remain in charge on Monday and know that he will be fully focused on the task ahead. I also know that the massive amount of work being conducted by the club behind the scenes and under the radar will continue until we are ready to announce the identity of our new Head Coach and I am fully confident that this time it will be the right choice. Football is traditionally referred to as a game of two halves but the Brentford versus Nottingham Forest match yesterday afternoon broke new ground as it is best described as a game of three thirds – a first forty-five minutes where absolutely nothing happened, a pulsating fifty-two minute long second half packed with incident and action and then the post match press conference where much was revealed. The Bees had not seemed to have benefited from the international break and were flat and torpid in the first half. There was lots of passing – mostly sideways but absolutely no pace, movement, energy, vigour or penetration. In another words this was not a typical Brentford performance and it felt almost like a practice match or shadow boxing as the ball was moved slowly and carefully from player to player with nobody able or prepared to attempt the killer pass. Our sole tactic seemed to be to give the ball to the ever willing Alan Judge and hope that he could create something out of the blue. Forest set up in two banks of four and stifled us and their goalkeeper Dorus De Vries must have been the coldest man at a frigid Griffin Park given his total lack of action. The visitors kept Ward and Mendes wide and they created several chances for Nelson Oliveira but thankfully David Button was sharp and alert and kept the Bees in the game with a series of saves – none out of the ordinary it has to be said, but the first half was total one way traffic and the Bees were distinctly fortunate to go into the break on level terms. Lee Carsley apparently got into his team at half time but nothing much changed early on and Brentford were indebted to Button for a wonderful clawing save from Oliveira’s header and Lansbury was allowed to run through a static midfield who waved him past before shooting a presentable opportunity over the bar. John Swift had endured a tough day with nothing going right for the youngster but he finally put in Brentford’s first on-target effort when his twenty-five yarder finally forced the frozen De Vries into action. Carsley had already demonstrated his frustration at what he, along with the rest of us, was being forced to endure – although he at least was being paid to freeze – by belting the ball miles in the air when it fell out of play by the dugout. Finally, his patience exhausted, he made two significant changes on the hour in an effort to breathe some life into his sluggish team. Swift and the totally anonymous Vibe were replaced by Canos and Hoffman although there were several others could could also have been hooked without too much complaint. Suddenly the tempo changed as the Bees were inspired by the effervescent and gifted young Spaniard, and just as was the case against Preston, Canos had an instant impact, scoring his first ever league goal with a close range effort in a packed six yard box when Dean headed down a Judge cross after a McCormack corner had been half cleared. The Bees were inspired by the substitution as Canos roared around the field pressing, passing and dribbling and Hofmann too finally provided an outlet with the size and strength to hold the ball up. He is also a gifted footballer and used his sleight of foot to bamboozle his tall markers and bring others into play. Suddenly the Bees took control. Judge shot over and a pulsating move ended with McCormack stretching but just failing to reach a deadly low cross in front of an empty net. Then the Bees self-destructed when Dean mis-controlled, overran the ball and tried to make up for his mistake with a lunging tackle which was harshly penalised by the referee. Dean heatedly disagreed, picked the ball up to remonstrate and demonstrate the legitimacy of his challenge and when Williams went to grab the ball, Dean’s swinging arm apparently caught the Forest substitute who went down as if shot. Referee Malone produced the red card with Stroud-like speed and in an instant the match was turned on its head. Villain or Silly Sausage as Dean was unforgettably described by Billy Reeves after the match? Williams certainly made the most of his opportunity but Harlee was impetuous and gave the referee a decision to make, not forgetting that the whole incident was caused by his own error whilst in possession of the ball. Whatever actually happened, and the incident was over in a flash, I cannot see an appeal succeeding and we will lose Dean for three crucial matches at a time when he and Tarkowski were playing so well together. Jack O’Connell replaced Judge and slotted in well but the damage had been done and a Forest team which had squandered its opportunities was offered an undeserved way back into the game and they took immediate advantage when a Mills cross was criminally mis-controlled by Diagouraga on the edge of the penalty area and the predatory Lansbury took full advantage of the gift and slotted the ball low into the corner. Brentford now had twenty long minutes to hang on, as Forest would surely go for the jugular, but the anticipated bombardment on our goal never happened. Bidwell and Yennaris were immense and the two centre halves won everything. Woods, McCormack and Diagouraga covered, chased and held the ball whenever possible and Hofmann and Canos worked hard and never allowed their defence to settle. In short we looked like a Brentford team again and we finally began to believe that we could hold onto our hard won point. Even better Carsley kept waving us forward as he realised that attack was the best form of defence. Canos turned brilliantly in the box and his effort forced a wonderful save from De Vries. McCormack had impressed with his set piece delivery and a perfectly placed long free kick was met by Tarkowski but his header clanged clear off the post. Cue tumultuous celebrations and yet another in a catalogue of late winners by a team that never knows when it is beaten. The rollercoaster ride of a second half had ended with three glorious and unexpected points when at one time one or even none had appeared more likely. What can ever beat the excitement of a ninety-sixth minute winner? Let’s just hope that it was simply a case of blowing the cobwebs out of our system after what was a lacklustre first half non-performance. Canos and Hofmann provided the catalyst for our recovery and we were much improved in the last half hour. If that was not enough there was far more to come when Lee Carsley was interviewed by Billy Reeves after the match and made it perfectly clear that this had probably been his last match in charge with a new man expected to be appointed early next week. Lee then stated that he would be remaining at the club to support the new Head Coach and would also return to his Development role. Paul Williams would also remain in post. Good news indeed! There is a lot there to assimilate and I think I will let the dust settle before I attempt to do so. I assume that Pep Clotet will be the new man in charge with Carsley staying around to assist in the handover and Williams remaining as a first team coach. Whether Lee then returns to his former position as Development Squad Manager and, if so, what that might mean for Kevin O’Connor are questions that remain unanswered at the present time. At this point I am sure that all Brentford fans would like to join me in giving thanks to Lee Carsley who has won five out of his nine matches in charge and been responsible, along with Paul Williams, for a total sea change in our approach and performances. Brentford break the mould and do things differently it would appear and I am sure that never in the history of the game has an interim Head Coach had such a run of success, won the Manager of the Month Award and then voluntarily given up his post despite the entreaties of the club, because it is not what he wants to do at this juncture of his career. Only at Brentford…. Thanks Lee for everything you have done and I am delighted that his talent and influence will not be lost to us. What a day and I am sure that there will be more exciting news unfolding within the next forty-eight hours. What I can say without a shadow of doubt is that it is never dull being a Brentford fan! The rumours about Brentford’s potential interest in bringing in current Swansea Assistant Manager Pep Clotet as our new Head Coach received a fairly mixed response from many of the readers of my initial article. I hope we keep Paul Williams who has played a big part in the recent upturn of results. My comment would be is that when Pep gets the top job things have not gone well. I would suggest also his appointment as Monk’s assistant coincides with the downturn at Swansea. Sorry to be so negative! How can that be true? 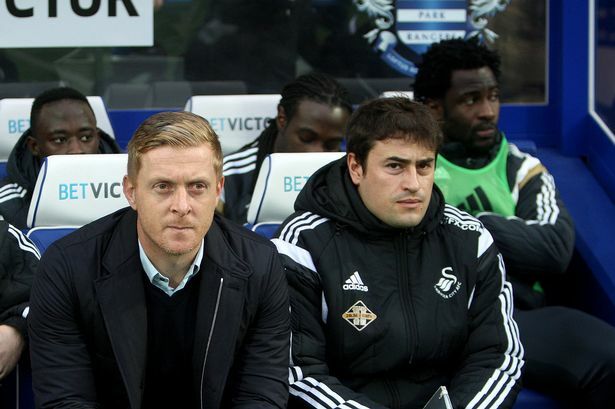 Last year Swansea had their best ever season – and that coincided with Clotet’s appointment. Swansea are probably the nearest model to the way that Brentford operate so it seems to make a fair bit of sense to be interested in someone from there. Whether he would be the right appointment remains to be seen, of course, and it’s a big jump from being the adviser to the decision maker but with a team of coaches to share the burden, maybe it would be a good move for him? The situation at Griffin Park has become like a soap opera this season – it’s hard to keep on top of what’s happening anymore! Like you Greville, I would love for Carsley to stay in place until the final ball is kicked next May, but apparently the owner does not share this point of view. I understand and appreciate the desire to get the new man in place ASAP but who’s to say it won’t be another Marinus situation – particularly given Clotet’s poor managerial record? We could then find ourselves onto our fourth head coach before we’ve barely gotten into 2016! If Clotet is indeed to be the new head coach at Griffin Park, then good luck to him. But the big fear for me is that the players have already been through so much already this season, that to get a new man in now could have a real adverse effect and undo all the fantastic work that has been done since Marinus and Roy were given the bullet. Let’s see what happens, but Clotet’s (admittedly youth-based) managerial record does not fill me with excitement or optimism. In fact, if the plan is to bring in a guy with predominantly youth management experience, why the hell not give the job to Mr. Brentford himself – Kevin O’Connor? He’s doing a great job with the development squad, he knows the club inside out and he is Brentford through and through. Unlike Pep Clotet. This is nothing to do with Matthew Benham. Lee Carsley simply doesn’t want to be a manager and wants to go to other pastures as soon as the new coach is in place. It is all very well talking about Carsley not being impressive but facts are facts. We won four on the bounce. The players now know what they are doing. The players are happy once again. The training methods are now working. The players are fitter and stronger. The players (seem to) enjoy playing for Lee Carsley. Pretty much the same players who were failing under Marinus. “Nothing to do with Matthew Benham” – this is also extremely wide of the mark! Of course it is everything to do with Benham. Benham is the driving force and the beating heart behind everything that happens behind the scenes. He is a successful and driven businessman and someone who plays to win. Hence the (apparent) decision to now dispense with the services of the man who has a) dragged us kicking and screaming out of a relegation dogfight and b) won the Skybet Championship Manager of the Month award for October! This has EVERYTHING to do with Matthew Benham, presumably hastened by Carsley’s consistent reiteration that he does not want the job. In the main I’m with beesyellow22 on this, let’s just rewind to the statements that came out of Griffin Park when Lee Carsley was put in charge until the end of the season. So that went well then didn’t it, as it seems he can’t get away fast enough – so why did he take it and why didn’t Brentford FC just say it was going to be a very short term move? If Clotet does join I can’t see Carsley or Williams being part of the team going forward. And what has Clotet actually achieved in the game to justify our pursuit of his services? There seems to be a fascination with overseas coaches, ironically I’d now convinced myself that Edinburgh and Smith could be decent appointments. bees yellow22, you said that Lee Carsley is leaving due to Matthew Benham which is complete rubbish and a slur against our owner. How many more times does Lee Carsley have to say that he doesn’t want the job? In actual fact he hates it and wants to move on. Lee Carsley has done a good job and I also would have liked him to have continued but he just doesn’t want to. He wants to coach young players as he does with the England Under 19s and it gives him the flexibility for him to work on other things outside of football. I was not dissing Lee Carsley by saying look at his CV but it’s just an example of if he was on our list today as a target check out his history before joining us and you could find many negatives. We have had an horrendous injury list this season and unfortunately picked the wrong coach in Marinus Dijkhuizen, but this can happen to the best (Manchester United for example.) You might think this season is a soap opera but I among many other fans have enjoyed some great times this season with number one beating that lot down the road as well as our performances against Charlton, Leeds, Wolves, Bristol City and Blackburn to name a few. When the new manager comes in I expect Lee Carsley to help the transition for a week or so and Paul Williams to stay. I know the majority of our fans will get behind the new man and also expect the usual uninformed clap trap to continue on message boards. “The Club has moved swiftly and decisively in order to maintain its long-term vision and philosophy. That’s why Lee Carsley has been appointed as Head Coach for the remainder of the season. Lee has shown with the Under 21s that he is an outstanding leader. His work at the training ground has been hugely impressive whilst coaching the development squad and has demonstrated he understands the Club’s philosophy and the ambitions of Brentford FC. We believe these qualities will help Lee settle into his new role effectively and quickly”. As to his reasons for not wanting to continue, we can only guess and speculate – I don’t blame Matthew Benham for this at all, however the management team shouldn’t get a pass for the Duikhuizen disaster. I do wonder why once again why we have managed to make a mess of this, even if it is just in the way it was communicated. As for “uninformed clap trap” – really is that your answer to anyone who sees it slightly differently? I think you can do better than that. “Clap trap” wasn’t aimed at you but the more extreme stuff that has been aimed at Matthew Benham on other forums and social media sites whenever there are decisions being made. I would agree our PR has been dreadful at time over the last twelve months. Lee Carsley has never ever stated that he wanted to be manager until the end of the season although others have been quoted suggesting that for reasons I don’t know, maybe wishful thinking. It’s no secret that he gives a lot of time to charity work and being in youth football gives him the time to do that. I wish him all the best and look forward to the new Head Coach taking over hopefully this week. Fair do’s Bill, but there are some wide of the mark views on both sides of this. Like you I have enjoyed some great days already this season – with Charlton and QPR the stand outs. I don’t expect Brentford FC to be top six or chasing promotion either. I love the league and I’d just be happy to stay in the division with a bit to spare. I’d just like to see us settle down with the coach and players pulling together and playing some decent stuff. And I’d like the club to communicate and do its PR a bit better, so that we don’t need to speculate so much. Whoever is appointed it will be just another Matthew Benham gamble with little regard for the views of the Griffin Park faithful. For my money the “dream ticket”would be Kevin O”Connor and Paul Williams. Lee Carsley was the obvious immediate short term appointment when the decision made not to continue with Marinus. Who knows how hard he had to be persuaded in order to convince him to take the job and agree to take the reins until the end of the season? If there was any doubt at the time about his willingness to remain in post until May then it was a mistake to make the statement confirming that he would do so. What I suspect is that Lee did agree to do so, however reluctantly, but soon realised that he had made a mistake and has been actively trying to relinquish his position ever since. This is terribly disappointing given how well he has adapted to the role and the positive response that he has obtained from the squad as is reflected in our improved results and style of play. We therefore need to make another appointment and whoever we choose will be a gamble to some extent. Clotet is an interesting prospect for all the reasons I outlined in my previous article in terms of his obvious coaching ability and the lovely football that Swansea attempt to play. How will he do when elevated to the Head Coach role and will the players buy into his approach? These are imponderables that cannot be answered. I suspect that a firm decision has yet to be made and that the situation will not be resolved quickly. Talk is cheap and whilst all the rumours are still unsubstantiated, the fact remains that there is growing speculation that Brentford are closing in on their preferred choice to replace Lee Carsley as Head Coach. Much of the chatter is on social media but the mainstream press has finally joined in the fun too with The Daily Telegraph yesterday naming a new candidate, and one who had not previously been openly mentioned in connection with the club. According to journalist John Percy, the Swansea City Assistant Manager, Pep Clotet, is in serious contention to take over at Griffin Park. It would appear that any leak has come from the Swansea rather than Brentford end given that Percy is the Midlands football reporter for the Daily and Sunday Telegraph and predominantly deals with the Premier League. Indeed only a few days ago, on the ninth of November, he wrote a detailed story about the current state of affairs at Swansea and revealed that their manager, Garry Monk, has effectively been told by the club’s chairman, Huw Jenkins, to agree to changes to the overall management structure of the club or risk losing his job given Swansea’s recent dire run of only one win in their past nine games. It is alleged that Jenkins has suggested that Monk must agree to bring in an experienced coach to assist him and in that regard the name of Colin Pascoe, a Swansea legend and Brendan Rogers’s former assistant at Liverpool, has been mentioned. Now it emerges that Clotet, whose role at his current club might now be under real threat given the chairman’s apparent ultimatum, could be a serious target for the Bees and has apparently been interviewed by Matthew Benham over the past few days. Is Percy jumping to conclusions or could there be some – or even a lot, of truth in his suggestion regarding Clotet which has now been picked up by other media outlets in Wales? Perhaps it would help if we examined Clotet’s background and credentials in more detail in order to see if he might fit the criteria required for Brentford’s new Head Coach. He was born in Barcelona and is still in the first blossom of youth at only thirty-eight years of age. He had a totally undistinguished playing career before earning his coveted Pro License when only twenty-six years of age and took his first coaching role whilst still in this twenties at UE Cornellà before moving to RCD Espanyol’s where he worked with their youth teams. He then joined another local team in UE Figueres but was fired after only nine games as they were relegated from Segunda División B. He subsequently returned to his previous club, still in charge of the youths. Not the most impressive of starts but all the time he was gaining crucial coaching experience which he then began to use to good effect at Espanyol before he was was spotted by Roland Nilsson at Malmö FF, who won the 2010 the Allsvenskan championship with Pep acting as his assistant. His first major Head Coach appointment then came at Halmstads BK but it ended in disappointment when they finished bottom of the table. Still he kept moving on and learning and coached at Viking FK before catching the eye at Málaga CF where he began to make his name under Manuel Pellegrini by developing several young players who would shortly make an impact in the first team. Swansea City were impressed by what they had seen and in November 2013 Clotet was appointed academy consultant at the club before being promoted to assistant manager in May last year where he has remained ever since as manager Garry Monk’s main confidant and support. Those are the bare facts which confirm that Pep has packed in a massive amount of coaching experience despite his tender years but we also need to put some flesh on the bones and for that I am going to Mike Calvin who profiled Garry Monk in his excellent recent book on football managers, Living On The Volcano. Monk spoke extremely positively about Clotet when interviewed by Calvin. Apparently Pep was influenced greatly by the coaches at Barcelona and Johan Cruyff in particular before attending one hundred and sixty training sessions when Louis Van Gaal was in charge of the club in order to analyse the way he set up his teams to maintain possession of the ball. Closet is also renowned for breaking down matches into five minute segments so that he can assess thoroughly what is happening on the pitch and pass on information in real time to Monk. He is quite obviously open minded, thorough, relentless and committed to his role and would fit in perfectly with Brentford’s stats and analysis led approach. There is talk that he came onto the Brentford radar last year when he was recommended to the club and was apparently considered for the managerial vacancy at FC Midtjylland over the Summer and given the situation at Swansea, it would appear likely that he might well be available and would perhaps not require us to pay compensation in order to acquire his services. Like the majority of Brentford fans, I would prefer that Lee Carsley remained in post until the end of the season given the way that the squad has responded to him and the renewed sense of togetherness and organisation which has culminated in a series of much improved performances and results, however that does not seem to be an option given that it seems he is determined to leave his position as Head Coach as soon as possible given his total aversion to many elements of the job. If that is in fact the case then we can only thank him for all his efforts on our behalf and for buying us enough time to make the right appointment to replace him. I would hope that there will still be a role for Lee at the club given his obvious ability but somehow I doubt if that will suit him and his ambitions. Hopefully if and when the new man arrives there will be a hand over period and given his popularity with the players I would anticipate that Paul Williams will be retained as a coach which will help maintain some element of continuity. I am sure that this coming week will reveal whether or not Pep Clotet is the man for us. He appears to tick many of the boxes for us in terms of his background, reliance on stats and the fact that he has gained a massive amount of coaching experience around Europe given his relative youth. Most importantly, he has worked in England in the Premier League, fully understands the physical demands of the English game and is working at a club that is renowned for its excellent passing and possession based football. How players respond to him is something I am not qualified to answer. I might be wrong – I normally am – but it would not surprise me if Pep is the man for us and that as long as he can get the players on board and convince them to buy into his methods then we might well have identified a massively impressive candidate who will become exactly the type of Head Coach that we have been seeking .